Mission: To do what we say when we say we will do it. This starts with communication, answering the phone, or returning a call ASAP and most importantly going above and beyond in our service to our customers! History and Credentials: Our team has been in the construction and the general contracting trades for over 40 years. Our experience ranges across high-end custom homes, multi-family, remodels, commercial building, and more. 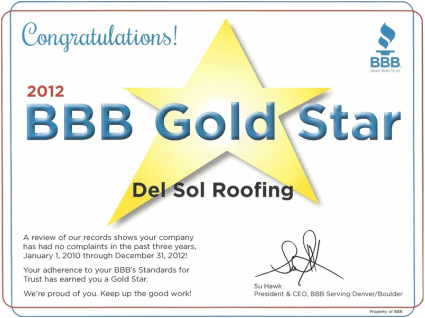 We are licensed, insured and BBB A+ accredited. Workmanship Warranty: LIFETIME. For as long as you, the Homeowner, live under the roof that we repair or replace you are covered under our workmanship guarantee. Not for 3 years, not 5, but as long as our work is over your head! Inspections and Assessments: Just call us and we will come and evaluate, inspect, assess… always free of charge! Service Areas: As a Colorado company, Del Sol will go just about anywhere in the state. However, our typical range has been as far north as Fort Collins, west as Eagle County, south as Pueblo, and east as Limon. So Why Choose Us? We believe the above reasons answer this question quite nicely.